Mouser Electronics, is now stocking the CG2H40xx and CG2H30070 gallium-nitride (GaN) high-electron-mobility transistors (HEMTs) from Wolfspeed, a Cree company. Operating from a 28-volt rail, the two HEMTs offer a versatile, general-purpose broadband solution for a variety of radio frequency (RF) and microwave applications. Wolfspeed’s reliable HEMTs are characterized by high efficiency, high gain and wide bandwidth, making them an ideal choice for linear and compressed amplifier circuits. The Wolfspeed CG2H40xx and CG2H30070 GaN HEMTs, available from Mouser Electronics, offer best-in-class reliability and a choice of two package types: a screw-down flange package or solder-down pill package. Designed with the same footprint as previous 0.4µm devices, the new HEMTs can be used as drop-in replacements in existing applications. The transistors are capable of high frequency operation to 6 GHz and deliver 62-percent efficiency at PSAT. 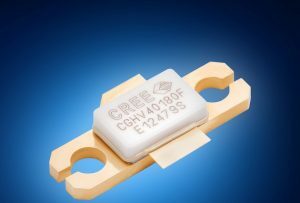 The high efficiency and wide bandwidth of Wolfspeed’s CG2H40xx and CG2H30070 GaN HEMTs enables RF design engineers to increase the performance of their RF amplifiers quickly and easily. The transistors are an ideal option for a broad range of RF power amplifier applications, ranging from military communications and radar equipment to commercial RF applications in industrial, medical and scientific industries. The CG2H40xx and CG2H30070 GaN HEMTs from Wolfspeed are supported by the CG2H4004F-TB and the CG2H30070F-TB1 demonstration boards, which allow engineers to efficiently evaluate the Wolfspeed HEMTs. The CG2H4004F-TB development tool operates at a frequency range of DC to 4 GHz, while the CG2H30070F-TB1 development tool operates at a frequency range of 0.5 GHz to 3 GHz. To learn more, visit mouser.com/wolfspeed.